A hernia occurs where there is a weakness in the wall of the tummy (abdomen). As a result, some of the contents within the abdomen can then push through under the skin and bulge is noticed. Normally, the front of the abdomen has several layers comprising skin, then fat, then muscles, which all keep the intestines and internal tissues in place. If, for any reason, there is a weak point in the muscles, then part of the intestines can push through. You can then feel a soft lump or swelling under the skin. This is the most common type of hernia. Males are more likely to have inguinal hernias, as they have a small tunnel in the tissues of their groins, which occurred when they were developing as a baby. This tunnel allowed the testicles (testes) to come down from the abdomen into the scrotum. Tissue from the intestines can also pass into this tunnel, forming an inguinal hernia. This also occurs when some tissue pushes through in the groin, a little lower down than where an inguinal hernia occurs. This occurs when tissue pushes through a previous scar or wound. They are more common if you have had a scar in the past that has not healed well. They usually occur within two years of having an operation. These occur when some tissue pushes through the abdomen near to the belly button (umbilicus). Umbilical hernias may develop in adults with being overweight (obesity) and excessive accumulation of fluid within the abdomen, such as patients with background of kidney conditions and dialysis. Para-umbilical hernias occur in adults and appear above the umbilicus. Although they are generally small, they usually need repairing because there is a risk of intestines contained within them becoming strangulated. Inguinal hernias are more common in males, whereas femoral and umbilical hernias are more likely to occur in females. A hernia is noticed incidentally or after a strain - for example, after lifting a heavy object or coughing. Usually, at first, the lump can be pushed back, but may pop out after straining again. It is not usually painful, but many people feel an ache over a hernia, which worsens after doing any activity. In time, they might become bigger as the gap in their muscle or ligament tissue becomes larger. Sometimes, in men, they track down into the scrotum. Bowel obstruction is one of the complications that can occur if hernia is not treated. If bowels protrude through the abdominal wall defect, it can become blocked, that is obstructed. It is noted by nausea, vomiting, constipation and abdominal and hernia pain, and unable to push hernia back. There is a small chance it might strangulate. A hernia strangulates when too much bowel (intestine) comes through the gap in the muscle or ligament and then it becomes squeezed. This can cut off the blood supply to the portion of intestine in the hernia. This can lead to severe pain and some damage to the part of the intestines in the hernia. A strangulated hernia is uncommon and is usually dealt with by emergency surgery. However, it is preferable to have the hernia fixed by routine rather than by emergency surgery. The risk of strangulation is greater with a femoral hernia than with an inguinal hernia. The risk is also greater with smaller hernias. A hernia can be fixed by a small operation. A scan, ultrasound or CT, may be required to understand anatomy of hernia and plan an operation. Wearing a support (truss) was a method used in the past but is now not recommended. A hernia repair is one of the most common operations performed by surgeons. It is very common for people to have their hernia repaired as a day case so that there is no need to stay overnight in hospital. A hernia can either be repaired under a local or a general anaesthetic. This will depend on the actual type of operation needed. The type of operation will depend on the type and size of hernia as well as patient’s general health. 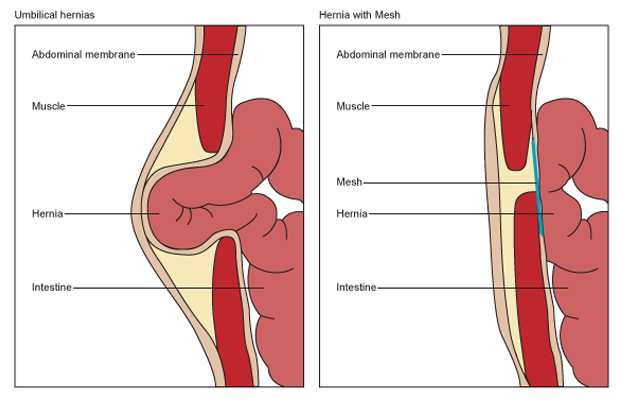 It is now more common to repair hernia with keyhole operation and using a mesh. This is a thin sheet of material, which is usually stitched or glued over the hole of the hernia. This has been shown to be stronger and more effective than sewing the edges of the hole together for inguinal hernias. With time, the mesh safely becomes incorporated into the muscle layer, which results in a very strong, permanent repair. However, hernias can return (recur) in a small number of people, when a further operation may be advised. Read an article on How do you treat a hernia?